Kappa is an all-time favorite dish for every Malayalee. Even though it is a strictly forbidden dish for Diabetic patients, because of its high starch content, most of them don’t observe the diet when it comes to their favorite kappa. My mummy (mil) is a diabetic, but an ardent Kappa fan. I have seen her face lighting up at the sight of kappa and relishes whatever meagre portion is allotted to her with great pleasure. Kappa vevichathu is greatly enjoyed with spicy red fish curry and/ or spicy beef fry. However there are a variety of combinations that can be tried with Kappa like Spicy Pork curry, Spicy Chala(sardines) curry etc. Kappa (Tapioca) is cooked with grated coconut and chilies and onion. For those who have only desiccated coconut, I have given the alternate method in the tips. But it won’t be as tasty as the original version. Anyway, let’s have some kappa and meen curry tonight. Enjoy!! Kappa (Tapioca) : 2 nos. Small Onion : 3-5 nos. Peel the thick skin of Tapioca wash and cut into small pieces leaving the thick middle thread. Boil water in a pan and add the Kappa pieces and cook. Once it is cooked, drain the water and add salt. Coarsely grind the coconut, small onion, green chilies, curry leaves and turmeric. Add this mixture to kappa, cover and steam for one minute. Mix/ mash well. The kappa should be fully mashed. You can garnish with mustard, curry leaves and small onion fried in oil. When you cut the Kappa, put it in water. If the water color turns white then it is good and will cook easily. Always add kappa after the water starts boiling. 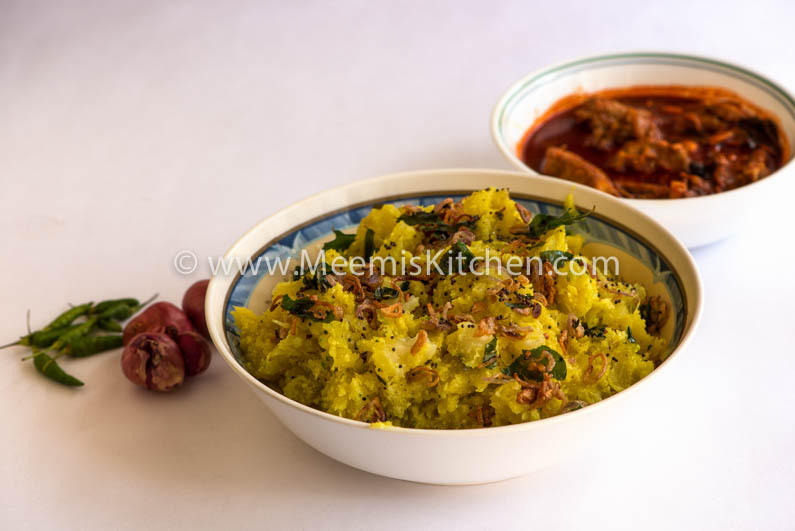 If you are using desiccated coconut, don’t grind the coconut, instead finely chop the onion, green chilly and curry eaves, mix with desiccated coconut and turmeric and add to cooked kappa(Tapioca) and mix well. You can add Jeerah (Optional), which is a prevalent style in southern Kerala. Enjoy kappa with Spicy Fish curry (Alleppey Style/ Kottayam Style). God Bless! !